The process of creating this piece began many years before I wrote the text or created the bookwork. It began when a photocopied image of an old photograph from Japan, of a young woman riding on the back of a stuffed crane, made its way into my hands. Initially all that I could find out about the image was that it was taken sometime in the Meiji Era; that the photographer was apparently anonymous; and that the name of the woman in the image was Kokiyo, and supposedly she was a geisha. I name the young woman in my bookwork, Kokyo, choosing to fuse the ki-yo in her name to kyo. This combining of sounds was something I was taught to do many years ago. And while it might not be done in every instance where such syllables come together in Nihon-go (the Japanese language), it felt right to me for this fictional piece. It was early in 2006 that I started to work with the voice recognition software iListen. I began to notice how odd and uncanny some of the translations were. I say “translations” here because it went beyond dictation. The software program didn’t always write out precisely what I was speaking, but did have a knack for offering up texts that seemed connected to the rhythms, ideas, and poetics of my own writing. At times, it even seemed to type out what was on my mind but not yet spoken. Given what I was discovering with iListen, I decided to put aside the idea of using this software in the way it was intended and to begin playing with it as a tool for creating new works. That year, while I was participating in the Babel, Babble, Rabble: On Language and Art residency at The Banff Centre, I decided to further explore this iListen process in what I call spoken & heard pieces, using digital images and written texts. In these works, the spoken text is what I initially wrote and the heard text was what the software heard me say. I continued to work with this process over that summer and then during a six week stint as artist-in-residence at the Women’s Studio Workshop in Rosendale, New York that fall, I worked with the Kokyo text piece that I started in Banff and created the artist bookwork titled until my body says sleep (Kokyo). 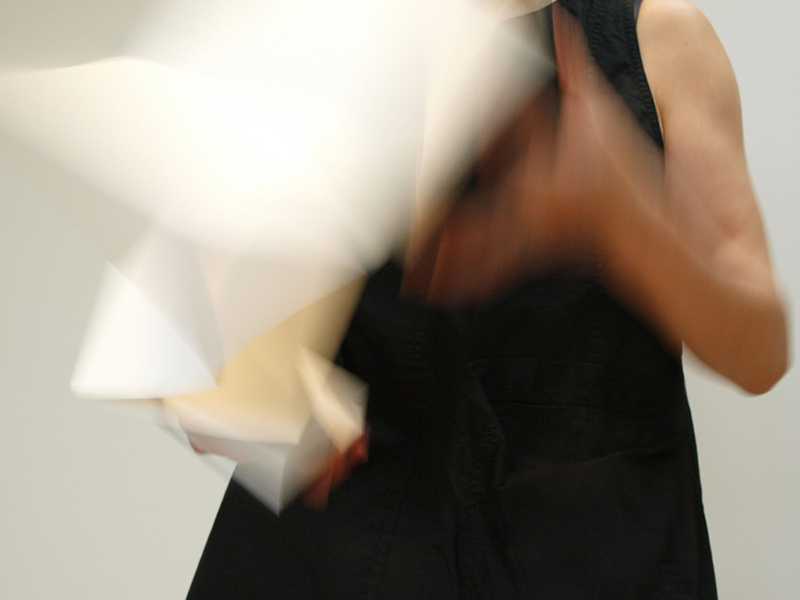 I was interested in the way the spoken & heard interacted in the text and how they might be experienced through the sculptural and performative aspects of the bookwork. My interest was in the experiential possibilities that were present and how they might shift one’s reading and understanding of the story. spoken: Shhhhe. She the young woman. She the crane. The scribe. The not geisha, named as geisha. The releaser of stories. She, riding a stuffed crazed-eye crane, with black tipped wings slowly flap flapping. Her slow sound reaching the inner ear like the rustle of a party dress. Swishing, swaying, moving through the night, with her feet off the ground. heard: She being. She the young woman. She the crane. The scrap. The not be shunned, named as Asia. The release of stories. She, that crazed eye crane, with black taped wings slowly flap flap being. Her slow sound reaching the inner year like the soul of a party dress. Wishing, swaying, moving through the night, with feet off the ground. 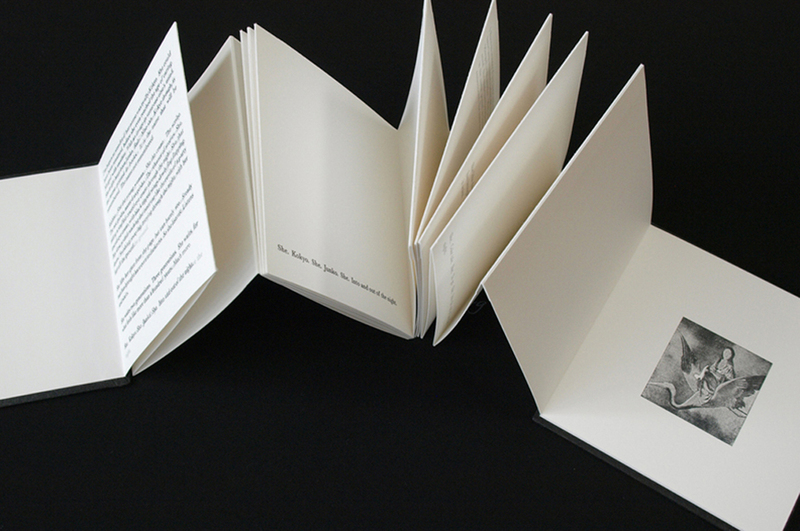 This accordion style bookwork was printed on a Vandercook Letterpress. The interior pages were printed on Arches 88 paper and the hard covers were covered in handmade flax and abaca paper and debossed. This bookwork was printed in a limited edition of 50 copies at the Women’s Studio Workshop and was funded by the National Endowment for the Arts. I’d also like to acknowledge The Banff Centre and The Canada Council for the Arts for their support of my practice and the development of this bookwork. Copies of until my body says sleep (Kokyo) are a part of The Banff Centre Library’s Artist Bookworks Collection and Women’s Studio Workshop Artist’s Book Collection, as well as at the Library of Congress, Virginia Commonwealth University, University of Utah, Wesleyan University, Rochester Institute of Technology, Swarthmore College, Florida State University, University of Delaware, Lafayette College, Skillman & Kirby Libraries, Indiana University, and University of Michigan.